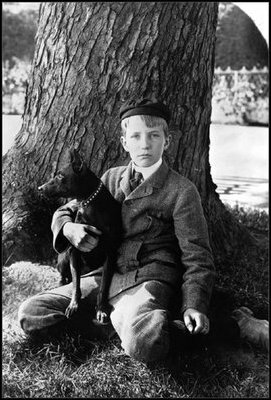 Kermit Roosevelt, son of President Theodore Roosevelt, sits with the Manchester terrier Jack on the White House lawn in 1902. Courtesy Frances Benjamin Johnston, Library of Congress. The lively young family did have quite the menagerie of pets, including dogs, cats, birds, and a pony. One of the beloved family dogs was a black, smooth-haired Manchester terrier named Blackjack, or Jack for short. Known for their alertness, Manchester terriers have been described as cat-like in their fastidiousness. Reserved with strangers but devoted to its family, the Manchester terrier generally is a well-mannered house pet. Apparently Jack did have at least one weakness: He was afraid of cats. One source, in fact, reports that the family cat, Tom Quartz, capitalized on Jack’s fear of her and terrorized him every chance she got. According to a biography of Theodore Roosevelt Jr., Jack was the family’s first ever “inside” dog, and he slept with Ted “and would crawl under the covers and sleep alongside his feet. At the end of Roosevelt’s second term in 1908, Jack’s coffin was exhumed and reburied at Sagamore Hill, the Roosevelts’ Long Island estate. Theodore Roosevelt Jr. wrote in All in the Family: “Mother wished another dog as much like him as could be found — a “Jack dog.” We got another Manchester terrier, a miserable meaching creature, like Jack in nothing but color.